BRYAN EATON/Staff photo. 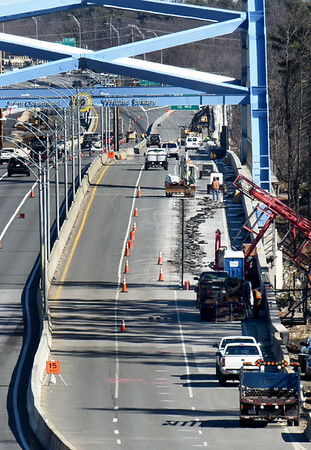 With both sides of the Whittier Bridge on Interstate 95 allowing travel north and south, crews are starting work on the shared-use path on the east side of the northbound lane. It is the first such path created along a Massachusetts interstate and will afford bicyclers and pedestrians access over the Merrimack River with three viewing spots.